Here’s a revelation. Hallmark movies may be all sorts of bad or dull but their characters are almost always consistent. The low quality can be attributed to many things – drab main characters, absence of strong supporting parts, overreliance on clichés, lack of cast chemistry. But even when the characters, usually female, make idiotic choices, there’s at least an internal logic at work. I mean, you and I might not drive a few hours days before a big parade just to recruit a new Santa Claus, but someone would, say a woman who loves the holidays so much she runs a year-round Christmas store. 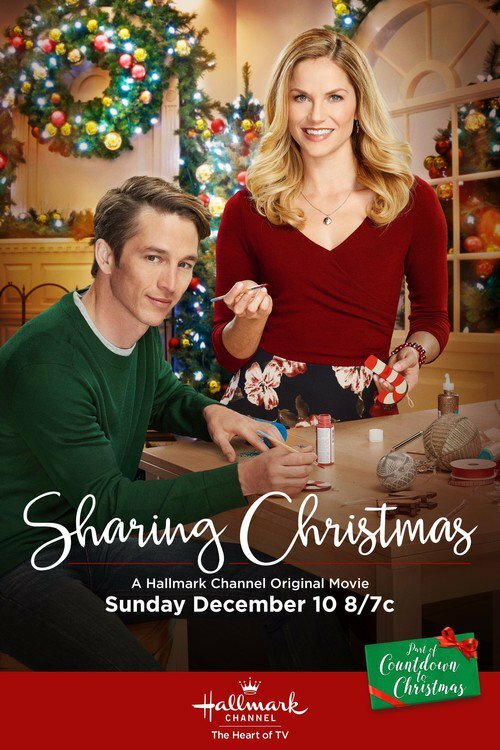 So I was surprised that Sharing Christmas, based on your standard big business eats small business storyline, had its routine plot corrupted by really bad character development. Primarily, it comes down to two would-be lovers/enemies who can’t figure out what they want and so end up doing whatever they want. Hallmark produces these stories year round, so I don’t know how this could have happened. Did someone go off-script and try to be original? Whatever the reason, the result is a movie that falls short of expectations. Never mind the plot, which is at least the fourth like it this year (i.e. A Song for Christmas, A Gift to Remember, and Christmas at Holly Lodge). Now it’s Stephanie’s (Ellen Hollman) turn to lose a business. She’s no sooner inherited her retiring parents’ Christmas Shop than she gets an eviction notice to vacate by the end of the month. This being New York City, it’s impossible to find another place that doesn’t also cost literally millions of dollars. It’s lucky then that she bumps into Mike (Bobby Campo), a cute guy who works in real estate. He offers to help her find a place – but then also reveals himself to be the one kicking her out. At least this is his boss’s plan. After finding out the two have their eyes on each other, she (Cynthia Gibb) arranges for Mike to help Stephanie “transition” out her shop. It’s a tone deaf decision and a cruel arrangement all around. The last thing Stephanie needs is a hot guy making sure that she leaves with all due haste. But this isn’t the problem; Hallmark audiences can take a heartless property developer. What is more difficult to understand is why Mike and Stephanie sometimes play along and sometimes do not. He goes ahead as directed, gently ushering the other tenants out because he is still needs a job. But he also spends his days helping Stephanie at her store like he’s a seasonal sales associate. Both are seemingly oblivious to the fact that he is the reason she will be unemployed and losing her family business, at least until he casually tells her not to take it personally, to which she’s like, um, okay. Then there’s Stephanie, who spends a lot of time sighing about her bad luck. She also needs to make plans to relocate but hasn’t done much outside of a Google search to secure a new place. Neither has she mounted an aggressive protest against the eviction. Without more noise, big, bad property developer is going to steamroll her, and new crush Mike is going to be right there too, flattening her pretty dreams…and possibly trying to stop them from being flattened? In the end, who knows where either character stands. They are supporting each other one minute, professionally opposed the next, clearly making eyes at each other all the while. It’s confusing and not at all genuine. Plus the ending is one mother of a deux ex machina. Bottom of the heap for you, Sharing Christmas. Posted in USA, Western TV reviews and tagged Christmas movies, Hallmark Channel, TV movie on December 19, 2017 by limmer13.